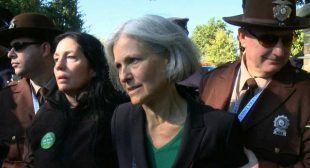 Green Party presidential nominee Jill Stein and vice-presidential candidate Cheri Honkala were arrested Tuesday as they attempted to enter the grounds of the presidential debate site at Hofstra University. Like other third-party candidates, Stein was blocked from participating in the debate by the Commission on Presidential Debates, which is controlled by the Republican and Democratic parties. Stein and Honkala were held for eight hours, handcuffed to chairs. As she was being arrested, Stein condemned what she called âthis mock debate, this mockery of democracy. Just hours after being released, Stein joins us in the Democracy Now! studio.